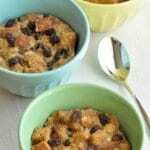 Microwave Bread Pudding | JPMA, Inc. Butter bread and cut into small cubes. Combine buttered and cubed bread, brown sugar and raisins in a one-quart microwave safe dish. In a microwave safe bowl or measuring cup, blend together the eggs, milk, cinnamon, salt, and vanilla. Heat on high for 2-3 minutes until hot, but not boiling. Pour over bread mixture and lightly blend together. Microwave uncovered at 50% power for 5-8 minutes, or until edges are firm and the center is almost set. Serve with low-fat vanilla or lemon yogurt.